Radiation is energy that is used in X-rays, nuclear power plants, cancer treatments, and nuclear weapons. Substantial radiation exposure in a short period may cause burns or radiation sickness, which results in symptoms like skin burns, nausea, weakness, hair loss, and reduced organ function. It may result in death if the exposure is high enough. When someone is exposed to radiation over a long period, their risk of cancer is increased. Additionally, radiation may cause genetic mutations that may be passed on to children. If you are harmed due to radiation exposure on the job, the Boston workers’ compensation lawyers at Pulgini & Norton are ready to help you. Radiation exposure may lead to serious illnesses. In order to recover workers' compensation benefits, you will need to report an illness to your employer, which must then notify its insurer. In some situations, such as when you work in a nuclear plant, a detailed report would be made in the case of an accident involving radiation exposure. However, even if it is not common practice to make a report in your workplace, it is wise to make sure that an accident report is created. You should also see doctors as soon as possible once you realize that you may have been exposed to radiation. They can determine the medical effects of the exposure and your next steps. 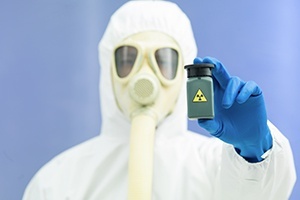 If you have missed at least five days of work due to an injury or illness related to on-the-job radiation exposure, your employer has seven days other than Sundays and legal holidays to report the injury or illness to its insurer. The insurer then has 14 calendar days from receiving the first report of injury to either mail a check or send a denial form that states why it is denying the claim. Although you may submit an employee claim to the insurer at any time, the Department of Industrial Accidents, which administers claims, may not accept the form unless 30 days have passed from the first date of disability or unless it is accompanied by an Insurer's Notification of Denial. Although you have a legal right to workers' compensation benefits after work-related radiation exposure injuries, you may have trouble securing these benefits, particularly if the exposure occurred years ago and was a result of small cumulative amounts of exposure rather than a single event with a significant amount of exposure. In order to recover benefits, you will need to establish a causal relationship between your radiation exposure and the illness or injury. An experienced attorney can help you do that. The insurer is likely to try to point to a pre-existing condition or other factors, but as long as the radiation exposure was a major cause of your illness or injury, you should be able to obtain benefits. It need not be the primary or sole cause of your harm. If you suffer injuries due to job-related radiation exposure, you should retain an experienced Boston workers' compensation attorney. At Pulgini & Norton, we can advise you about every aspect of your claim. Your ability to recover benefits is too important to leave to chance. We also represent workers' compensation claimants in Braintree, Malden, and Lowell, among other Massachusetts communities. Call Pulgini & Norton at 781-843-2200 or use our online form to set up a consultation with a workplace accident attorney.